Ph, Style | Fall Winter 2012 2013 collections. The second cover up from London Fashion Week. I made a 'Pretty Belts' cover up before. 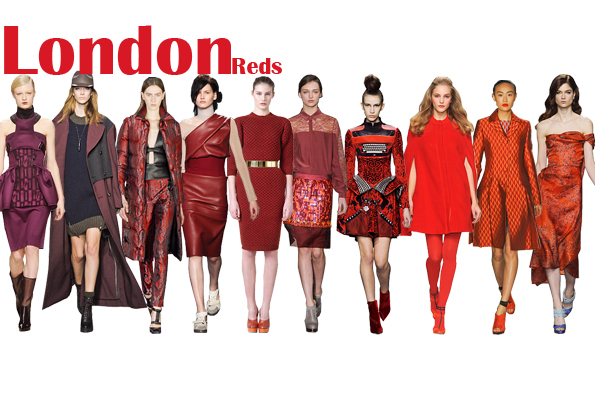 There were a lot of reddish looks shown on the catwalk. I think this is a 'trend' that is already wearable during summertime, so I know what I have to buy! As you can see there is a lot of variety in the clothing shown in red shades, so this color can be edgy, sweet, ladylike, dandy or whatever style your into. Update 12-04-2012: With the designers! I love the 3th from right hehe!! is my fav colour! Thank you. Great dresses, especially the one right beneath the word "reds", it's stunning. I love red, it's a beautiful color. Lovely dresses.